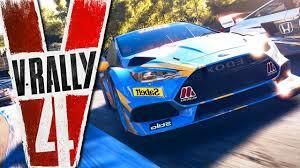 V-RALLY 4 is launching on the Nintendo Switch tomorrow (December 14th) in Europe. Those in the US have to wait quite a bit longer as the game doesn’t release until February 5th, 2019. The Switch version support single Joy-Con play and split-screen multiplayer mode in both tabletop and docked mode. Multiplayer: Face an opponent in local split-screen multiplayer. 22 environments and Stage Generator: Numerous pre-generated tracks and the ability to drive randomly-generated special stages in Rally mode. Vehicle customisation: In Career mode, a livery editor allows you to completely customise your vehicle and give it the colours you want.